This quick one pot chicken recipe blends lemon, artichokes and fresh thyme into a fresh and easy dinner. 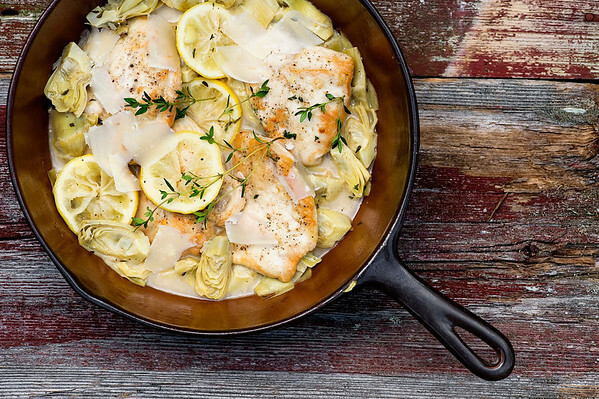 Lemon chicken with artichokes for the easy delicious supper win! Mmm, mmm, mmm, lemon chicken with artichokes, all cooked together with some fresh herbs in one pan and topped with shaved parmesan. There are one skillet dinners, and then there are One Skillet Dinners. This one is a lemony extravaganza of deliciousness that can be an elegant dinner party centerpiece or a simple and satisfying Thursday night suppers. Recipes like this I truly love. 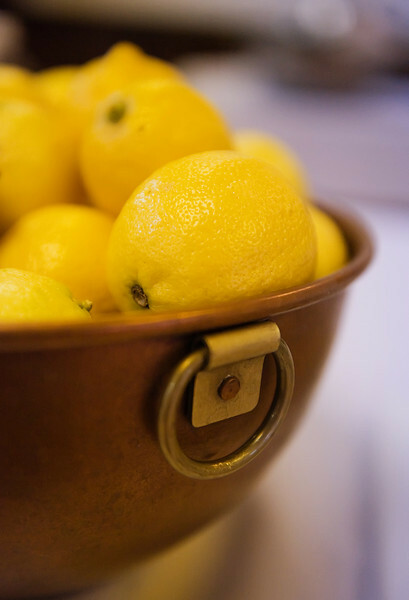 Ready to lemon up your chicken? Let’s make it! Lemons. I ain’t gonna lie…this is Lemon chicken with a capital L. It’s lemonishly tart, which is one of the reasons it’s high on my hit parade, but I am a lemon-loving girl. 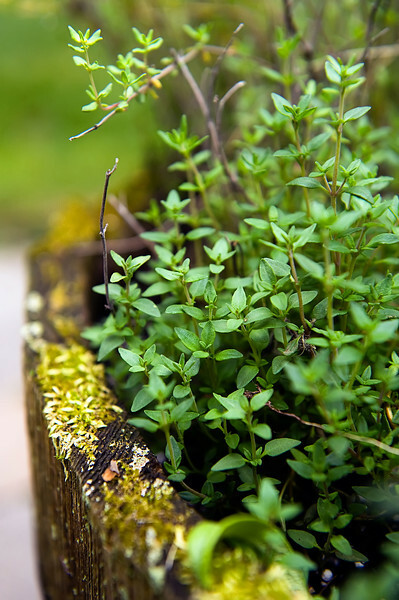 Thyme! Wonderful, fresh, pungent thyme. It’s growing like wildfire right outside my kitchen door if you need any. Here’s how it goes. Take a few boneless chicken breasts and pound them until they are about 1/2 inch in thickness. I do this by putting them between two sheets of plastic wrap and whacking them with my handy meat mallet, which does wonders for releasing all the frustrations of the day. It also sends the dog and the Southern husband to the farthest regions of the house, where they probably have strategic discussions about when it is safe to return. Next, grab your lemon and slice it into nice thin pieces. Make sure you pop out all the seeds…I don’t know about you, but it irks me to find lemon seeds in my chicken dinner. Now find a nice big heavy skillet and you are ready to roll. Dunk your chicken in some seasoned flour and fry it in a little canola oil until it is nice and brown on both sides. We’re just looking for brown-ness, not done-ness…it’s going to finish up in the sauce. Return chicken to skillet, stir in thyme until thyme is mixed in and chicken is coated with sauce. Scatter shaved parmesan on top and serve right out of the skillet – it’s homier that way! If you want a little extra zing, stir in a couple of tablespoons of capers at the end! This looks perfect, Kate! I could dive right into that skillet! I’m a lemon with a capital L kinda girl also! And an artichoke with a capital A one. This dish seems kind meant for me. Mmmm. Yummy. Yep, I’m all about the lemons and the artichokes and the chicken and the Parm…well, there are those things I *don’t like*, but you’ve hit the jackpot with many of my special loves on this one. Great! Hurray! I love meals that put absolutely everything I love in one pan. It just feels so right. We love so many of your recipes, but this one was jus a little too bland. Maybe some capers would help add a little more flavor? Thanks for all you do! YAY!! ONE DISH!! and NO OVEN!!! Although I could probably mess up my entire kitchen anyway. Love this whole thing. I’ts our din tomorrow!! Thanks as always; LOVE your blog. It was the first one to which (grammar, y’know) I ever subscribed, and still my favorite!! Lynn, you always make me smile. :) Happy July, and happy summer chicken supper! This looks absolutely delicious! Thanks for the shout-out on my chicken recipe! Love all of the artichokes! I can’t wait to make this! Yum….Chicken artichokes and lemon….my favorites! I love your website and often find the yummiest recipes. The one that stands out is the Pasta with Sweet Yellow Tomatoes. I’m not sure why, but it’s simple and delicious and a little bit different. So glad you liked this one! And yes, I’m counting the days until the yellow heirloom tomatoes show up…won’t be long now!! Since I live 20 minutes from Castroville, CA (the artichoke capital of the world) buying these tasty thistles is easy to do. I love the simplicity of the recipe that has some of my very favorite ingredients. Pinning this one to my dinner menu for the week. Awesome! The artichoke capital of the world? I am so envious!!! Enjoy this one! Kate: I made the Lemon Chicken with Artichokes and it was great – and easy, and quick. Even my picky 10-year-old liked it. Will definitely make this again! I just may have to make this for dinner tonight! Looks scrumptious. I always love the recipes on your blog. This is the bomb! Pour me a glass of Roussanne/Marsanne with it please. Making this tonight but my husbands question is “are you serving it with rice or quinoa?”. Hmmm. did you serve it with anything or just chicken and artichokes? He also doesn’t consider artichokes a real vegetable…. He thinks it’s a garnish. Any suggestions? Looks awesome by itself though!!! Can’t wait! Off to puns the chicken! That was supposed to be Pound the chicken. I ended up making quinoa and it really was great! Jazzed up boring old quinoa but hubby said he would have liked a salad or something green. :) Saw that coming. I think I’ll try adding aspsaragus in it as well next time. I loved it, but my daughters (2 & 4) thought it was too sour. Can’t please them all! Ever. Hi Nikki – one cup of wine, and just salt and pepper for the flour is fine! Was thinking about making this tonight for dinner as it sounds easy/delicious. Is it a necessity to cover the pan or can I get away with it without doing that? My large skillet does not have a cover. I have not made this yet, but I have a few questions. Would it work to cook with chicken without the flour? Also, what kind of wine do you use? I definitely think you could use fresh artichokes – I would get the baby ones, and cook them ahead of time so they are tender enough. 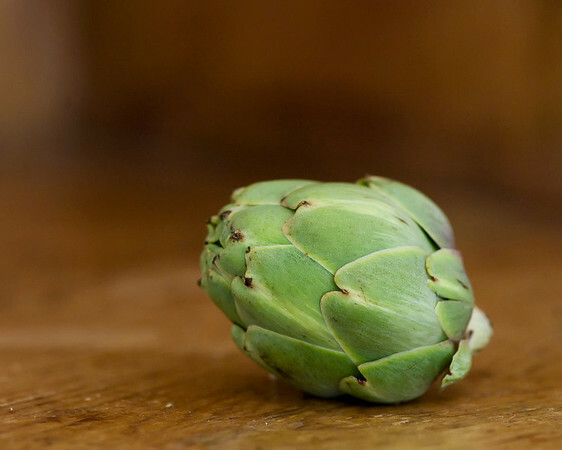 I wish I had easier access to fresh baby artichokes – they are so scrumptious! Will canned artichokes suffice? If I drain all the liquid out? Thanks so much for the response! Much appreciated! Great recipe. I made it with fresh grated Asiago cheese. My husband said it was the best chicken dish he ever had. Loved the artichokes, lemon and fresh thyme. Thanks for posting. This recipe is one of my favorites ever! I didn’t like artichokes before I made this, and now I do!! SO delicious! Great flavor combo! Jill! You are so nice to tell me this – and yay for artichokes (I love ’em!) Happy New Year! Kate, I love all of the ingredients in this recipe and will prepare it this week! Hi Allison! I’m not sure half and half would make it thicker – it would definitely add to the volume, but not sure how it would work with the lemon. I would suggest adding 1/2 to 1 cup of chicken broth to the sauce, and whisking in about a quarter cup of flour. That should add to the volume and the thickness. Hope this helps!